John Nesselroade, Hugh Scott Hamilton Professor of Psychology (emeritus) , received his Ph.D. in psychology in 1967 from the University of Illinois at Champaign-Urbana. Subsequently, he held research, teaching, and administrative positions at both West Virginia University and The Pennsylvania State University. Nesselroade has also served as a visiting senior fellow with the Max Planck Institute for Human Development and Education in Berlin. In 1991, Nesselroade began his career at the University of Virginia as the Hugh Scott Hamilton Professor of Psychology. He is founder and director of U.Va. 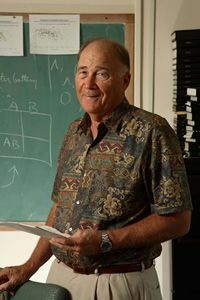 's Center for Developmental and Health Research Methodology, a leading training program for undergraduate through postgraduate education in quantitative research methods that relate to process and change.."
Nesselroade has now contributed over 45 years of work to his discipline, and he continues to research, teach, and innovate. The Gerontological Society of America awarded Nesselroade a Distinguished Career Contribution Award in 2003 and the Kleemeier Award, given annually in recognition for outstanding research in the field of gerontology, in 2006. He has been named a fellow of a number of prestigious associations, including the American Association for the Advancement of Science, the American Psychological Society, and the American Psychological Association.